The Bhagavad Gita is one of the most studied and most translated texts in the world’s wisdom literature. Teachings from the Bhagavad Gita is a loose translation of the original, focusing on what is relevant to us and making the essential points clear. Often known simply as The Gita, it teaches a balanced way of activity, devotion and reflection which all sincere enquirers can follow. It promotes skillful living and progress towards the goal of discovering the supreme Being as our own Self and the Self of all. 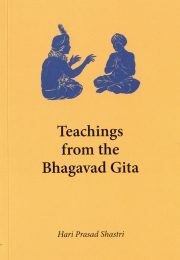 A relatively short text of 700 verses in 18 chapters, the Gita summarises the essential teachings of the Upanishads, which revealed the great truth that the individual soul is not in essence different from the Absolute, and that this identity can be realized, thus fulfilling the highest potentiality of human life. The Gita has been recognised for centuries as one of the foundation texts of the non-dual teachings. Shri Shankara wrote an extensive commentary on it, showing how its teachings on action and devotion fit into the non-dual view. Teachings from the Bhagavad Gita presents this helpful, all-embracing outlook, without philosophical obscurities. The Bhagavad Gita has a historical and cultural connection with the religious traditions of India. It was likely written down, in Sanskrit, during roughly the same period as the Christian Gospels were being composed around the Mediterranean, and in some ways the Gita stands in a similar relation to the Upanishads as the Gospels stand to the Hebrew canon. It restates eternal truths in a relatively accessible, approachable form. The essential teachings from the Bhagavad Gita as presented here, can be read and understood without reference to any particular religion. The central message transcends religious differences and concerns precisely that which exists as the reality underlying the universe of matter and energy, and as the light of Self in all human beings. This is an accessible introduction to the Bhagavad Gita. If we are practicing meditation on the related disciplines, it would be a helpful book to read during our dedicated study time.